The idea of putting real events into a novel of any genre can produce different responses in writers. Some might say ‘isn’t that a cop-out?’ Or ‘won’t that date my story?’ Well, not only did I build my bestselling thriller ‘Patriot’ around a real event in the future, but I also used debate about that event to inform my plot, the actions of my characters and ultimately many of the ideas within the story. This event is the planned drawdown of US troops from Afghanistan in 2016. Not only is that due to happen almost three years after the publication of ‘Patriot’, the discussion about this on news networks throughout that time is keeping the subject of my book topical in people’s – and therefore potential readers’ – minds. Using topical news in your book can also be kept fresh by keeping the themes big. The main theme in Patriot is terrorism; something that has been with us since the dawn of civilised society, but which is certainly recognizable to most people from the 1970’s onwards in particular. This allows readers to connect to the your story at a much deeper level; they sub-consciously drawn on a well of knowledge and put it in context for themselves. Maybe readers have their own opinions about those events, too. The role of the US and her allies in Afghanistan has been the subject of much debate over the past few years. Giving this topic its own role in your book can create fresh ways of approaching the debate, it can also be thought provoking, without being dry or even taking a particular point of view. My heroine, Brooke, gets in so many scrapes there isn’t much time for the readers to draw breath, let alone ponder issues of geo-political significance. But, maybe after the book is finished, there is more to reflect on, as some reviewers have commented. Ultimately, it takes skill and substantial amounts of research to incorporate real events into a novel. I hope that I’ve shown in Patriot how it can be done without falling into any bear-traps (although there is an actual bear in the story) and hopefully, kept my novel both fresh and engaging. When I began to think about settings for Patriot, I remembered the old advice “write what you know”. Therefore all the key settings of Patriot – Labrador, Washington D.C. and London – are familiar to me. The only exception is Afghanistan, which features in the prologue only. For that, I spoke to ex-military personnel who have fought in desert situations and I also watched a lot of YouTube footage. As a journalist myself, research is second nature! Yet I needed to do very little of that when it came to the North American settings. I used to live in Washington D.C., so I know its pace, the people, the locations. Perhaps however, the stand-out setting for Patriot is that of Labrador, where a large part of the novel – and the action scenes in particular – takes place. Labrador is that huge chunk of Canada on the eastern seaboard that’s the size of much of Western Europe, but which has the population of a small town. It’s a place I know pretty well, as I led a canoe expedition across part of it a few years ago. Travelling with just my Innu guide, Jean Pierre Ashini, we paddled through some of the harshest country in North America, following the pioneering route of Edwardian explorer Mina Hubbard. That’s another story however, but it is one I tell in my travel memoir, Lost Lands, Forgotten Stories, published by HarperCollins in 2002. I chose Labrador as a key setting in Patriot for several reasons. Primarily of course, because it is beautiful, remote and intriguing. Intrigue is always good in a thriller! Its remoteness also means that it is ‘believable’ (in thriller world) that the events depicted could really go unnoticed there, thanks to the lack of people. Also useful from a thriller writer’s point of view, is the fact not many people outside of Canada (and not that many inside, either!) know Labrador very well. This really gave me a ‘blank page’ on which to project my story, as many readers will have no real preconception of the place. As it happens, my own familiarity with Labrador means that I was able to describe it authentically; how it feels, smells, sounds. The bugs really are huge and plentiful and the backcountry really is mainly frequented by fishermen, hunters and prospectors. For many people in the 21st century, life is very technology dominated. Most live in big cities and the wilderness is – and to some extent always has been – a threatening, frightening place. This also is very useful in a thriller! As Brooke travels through this unknown land, she faces many kinds of threats, both known and unknown. The reader’s unfamiliarity with it and that unspoken menace all add to the suspense. The story of Patriot is also orientated around technology, in everything from modern communications via satphone to the nature of the threat against America. This is another reason why I chose to place so much of the action n Labrador. This wilderness, where the weather, the landscape and the animals are dominant, is a huge contrast – and counterbalance – to these technology based themes. Although I impose a fictional story on a very real landscape, anyone familiar with Labrador would recognize places referred to in the book. The cliff over which Kyle finally throws off the assassin sent to kill him is a figment of my imagination (although there would be countless that would pass for it in a movie – take note, Hollywood!). Yet Goose Bay and its huge airport do exist, as do the pretty painted wooden houses of Happy Valley. Even Okak is a real place, although it is little more than a name on a map, marking a deserted cove in the far north. It is really that sense of an ‘empty’ map that inspired my own original expedition there and therefore the setting of this, my first novel. Originality is vital for any literary work and I think – I may be wrong – that Patriot is the first thriller to be set in this vast corner of the continent. I hope readers find it as intriguing and enthralling as I do! AS Bond will be stopping by to do some Q&A sessions and give interviews throughout the month of June. There will also be reviews, extracts from the novel and some news on Brooke Kinley’s next adventure! Patriot is available from 51 Apple iTunes stores worldwide. The first five people to tweet my blog link and twitter handle @brookekinleyadv will get a free eBook of Patriot out April 24th! When I sat down to write PATRIOT, the old advice ‘write what you know’ came to mind and I realised what I knew was wilderness travel, cedar canoes and adventure. I’ve spent most of my life looking for adventure, figuring out a way to live it and then writing about the experience in true-life adventure travel books and magazine articles. So when, after spending 16 years writing non-fiction, I decided to turn to writing fiction, the choice was obvious. I’d write the kind of book I Iove to read; an action thriller. The added bonus? Not only could I find another way to write about the exciting places I’ve been to and things I’ve experienced, but I could also invent a few more adventures I haven’t got round to yet. And maybe – maybe – get an excuse to do a few more crazy things (all in the interests of ‘research’, you know). As the first in my new series of ‘Brooke Kinley Adventures’, PATRIOT is, in part, based on my own experience of leading an award-winning canoe expedition in a remote part of Canada. I travelled with just my First Nations guide, Jean Pierre, through some of the harshest country in North America. This real-life adventure became my travel memoir Lost Lands, Forgotten Stories, published by HarperCollins and Eye Books and then, several years later, it also became the inspiration for the ‘action’ in my adventure thriller. My expedition set out to retrace the first ever journey (by a European) across Labrador, in eastern Canada. With just over 113,000 sq miles of country and a tiny population of around 40,000, Labrador today is not much different to when the explorer Mina Hubbard crossed it by canoe, from south to north, in 1905. Mina herself was completing a journey that had killed her husband Leonidas during his attempt three years earlier and her success – largely due to her team of three local Metis guides -made headlines around the world. Mina, and those like her are my inspiration and so when I began to plan my action thriller, it was obvious that one of the main characters should be a no-nonsense, go-getting woman. Step forward Brooke Kinley. Before you ask if she is like me, let me say clearly that I wish I was like her. Brooke isn’t fazed by anything, whether it’s running rapids in the wilderness, of asking questions at the Pentagon. Plus, she’s much taller than me! She can also start a fire in a rainstorm and knows how to deal with inquisitive bears. I saw a few of those on my trip through Labrador and a wolf tracked us for a while, but of course unlike Brooke, I didn’t find bodies in the forest, or uncover a plot against America. What a great canvas Labrador is though! A place that big and that empty; well, it’s ideal for letting a writer’s imagination run wild and I have the advantage of knowing what the place feels like, smells like and tastes like. 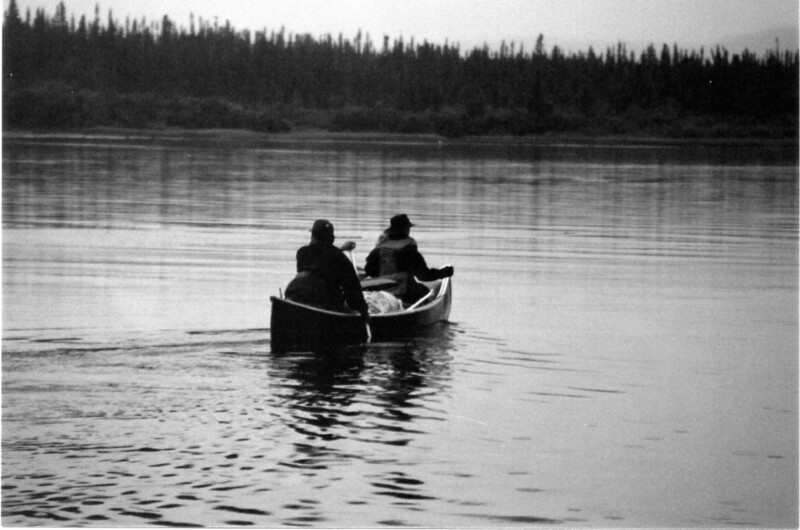 I know all about the swarms of bugs, the water that feels colder than ice, the scent of pine and spruce in the unpolluted air and a landscape that is so inhospitable, the only realistic way to cross it (except in winter) is by canoe. The scenes in PATRIOT where Brooke and Dexter (the novel’s lead male character) travel across Labrador by canoe are based directly on my own experiences. Kyle and Max’s work as prospectors is based on fact too; I didn’t meet any, but the evidence of their explorations where there to be seen. The Labrador coast is also famous for its mining and there are several old, abandoned mines lost in the wilderness. There are a few huge, modern ones too, but they are less evocative! When it comes to action thrillers – and political ones too, as PATRIOT is sort of a crossover there – few authors can say they have actually done the things theirs characters do. I can. Like Brooke, I’ve also worked as a journalist and lived in Washington D.C., but that’s a different story….